The forgeries of Inferis are legendary for their infamous and dark creations. Ranging from the most monstrous of mechs to the simple robotic foot soldier, these machines of war are built for only one purpose; the desire of the demon that created them. Among these numbers include the Defilers, a pet project by a as-of-yet-named demon who was slain by his own creations. Defilers are essentially automaton foot soldiers. Little more than mindless machines on the outside, on the inside the captured soul energy of slain demons are kept trapped within; their consiousness eternally woven into the machine's engines, capacitors, and radiators. 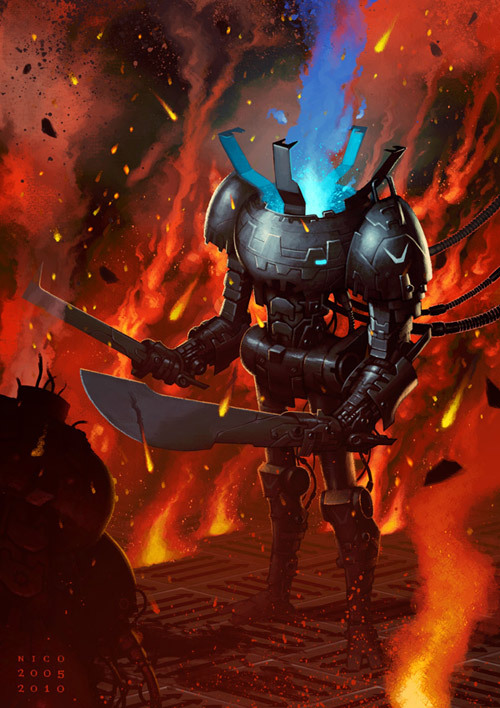 The resulting demonic energy manifests in the form of everliving flame, which in turn powers the automaton and allows it to perform basic functions. As a whole, entire warehouses of these machines exist throughout Inferis, their occupants remaining dormant and lifeless, awaiting the day when an Archdemon or one of their higher lieutenants can awaken them from their slumber. But in the Forlorn Ashland the original prototypes of these machines can still be seen walking to this day. Constantly repairing their bodies after misuse through the use of unrefined soul energy, these automatons can be heard making mechanical screaming and screeching sounds as their still-aware occupants try madly to free themselves from their mechanical prisons. It's believed this is how their original creator was slain; when his prototypes released themselves and attacked willy-nilly out of vengeance, only to find their only hope of freeing themselves died with their creator. Abilities: Defilers function much like autonomous demonic robots would expect to function. When not insane they follow the orders of their maker/owner without question. They do not tire, they do not think, they do not feel remorse. They are the perfect soldiers. This, coupled with the demonic fires constantly burning inside of their core, makes them difficult opponents to deal with. Unfortunately they are still machines and can still malfunction like most machines tend to do, and as such require repairs every now and then. The Defiler Prototypes are insane counterparts to their otherwise immobile and soulless brethren. These are the ones most often seen, flailing about like madmen as their conscious occupants scrabble to find a way to free themselves, only for their machines to repair themselves after endless abuse. The body of a Prototype is insanely resilient; their essences, however, can be shattered and thus eliminated through the use of holy rites, a powerful augment, or through the intervention of a powerful demon's apparatus. All Defilers come with a flamethrower attached to one arm and a melee claw/sword attached to the other. They are human sized in proportions and are designed essentially to be mechanical soldiers. As such, they behave as such; marching in file and rank when not driven mad by torturous awareness. - All of the Hell Princes can command a group of their own Defilers; these troops can act as inexpensive grunts to use in battle when they feel using actual demons isn't necessary. Each of these bear the color and/or likeness of the Archdemon that commands them (E.G. Emitting ash particulates (Beelzebub), oozing tar (Legion), painted with human blood (Mammon)). Lucifer chooses not to utilise them, instead just dispatching his Walking Apocalypses.